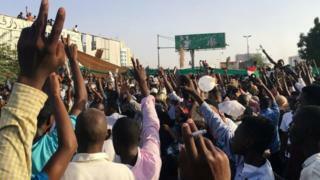 Sudan's police have ordered officers not to intervene against thousands of protesters who have demonstrated outside the army HQ in the capital, Khartoum, since Friday. The protesters demand the resignation of President Omar al-Bashir. Earlier, heavy gunfire was heard outside the HQ and there were reports soldiers protecting protesters had shot at government security agents. The US, UK and Norway have called on Sudan to plan a political transition. A spokesman said in a statement that police had "ordered all forces" not to "intervene against the citizens or peaceful rallies". "We call on God to preserve the security and calm of our country... and to unite the Sudanese people... for an agreement which would support the peaceful transition of power," the statement said. Previous attempts to break up the crowds have led to reports of soldiers intervening to protect protesters from National Intelligence and Security Service (NISS) agents. At least two soldiers are reported to have died since the demonstrations outside the HQ began. One protester, Ahmed Mahmoud, told the BBC that tear gas and live bullets had been used by NISS agents against protesters. He said soldiers had provided sanctuary for protesters within their compound. "It is pointless for Omar al-Bashir to continue using his thugs to get us off the streets as we are not going anywhere," he said. Another protester told the BBC not everyone in the army supported the protest movement; the highest ranks tended to support the government, while lower ranks backed the protesters. There have been calls urging Sudan's government to refrain from using force against civilians. 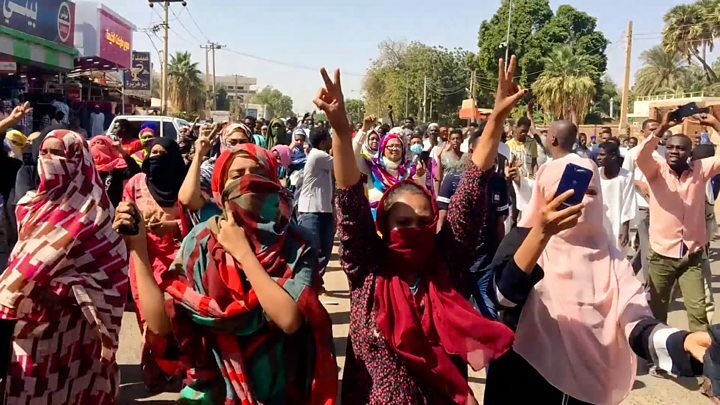 The so-called troika on Sudan made up of the US, UK and Norway has urged the government to respond to the demonstrators' demands in a "serious and credible" way. "Failing to do so risks causing greater instability. The Sudanese leadership has a grave responsibility to avoid such an outcome," it said in a statement. Government officials admit 38 people have died since the unrest began in December, but the pressure group Human Rights Watch says the number is higher. Mr Bashir's rule has been blighted by accusations of human rights abuses. He is subject to an International Criminal Court (ICC) arrest warrant over accusations of of genocide, war crimes and crimes against humanity. Last year, the Sudanese pound fell rapidly in value and inflation rose. The government then announced the price of fuel and bread would rise, sparking protests.